I was raised on the family farm in western Manitoba, getting involved in the community and volunteering was just a way of life in our family and these are the values that Linda and I raised our family on. My career in the aerospace industry started after I left school and started work as an apprentice aircraft mechanic, during the next thirty five years while working in the industry I was a aircraft mechanic, commercial pilot and for the last 10 years of my career I was Manager of Aircraft Operation for the largest Aerospace Company in Manitoba. I have been a very active snowmobiler for the past 35 years and filled most positions at the club and Regional levels. I am currently the President of Snoman (Snowmobilers of Manitoba) a position I have held for six years. Snowmobiling is simply a way of life for me and my family. 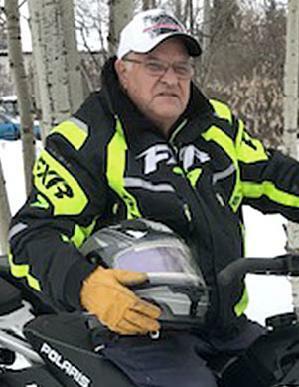 I am proud to say our three children and two eldest grandchildren are snowmobilers, I am now retired and live in Foxwarren, MB and devote a lot of my time to the promotion of Recreational Snowmobiling. I have always been a strong community supporter and volunteer. Having a career in the aviation industry and being a pilot it seemed that Rescue on the island was a natural fit for me and a way to get snowmobilers motivated to get involved in the Stars program. I support the Stars program because of the unique service they provide to rural Manitoba. There is also no other service that has the potential to reach snowmobilers in remote locations in time of emergency. I do not have a good luck charm, but always try to look at things objectively and in a positive manner, not to panic, but keep a clear vision of the objective. Ste. Amelie Ridge Riders Inc.
Swan Valley Snowmobile Club Inc.
Northstar Hill Climbers Snowmobile Club Inc.
Red River Trail Grooming Inc.